The Freestyle League is the one true way of showing off your tekkers on the ball! Connect your KickTrix with your mobile device with Bluetooth and save and share your scores! Compete against players around the world! Beat your previous records and fight for the top spot! 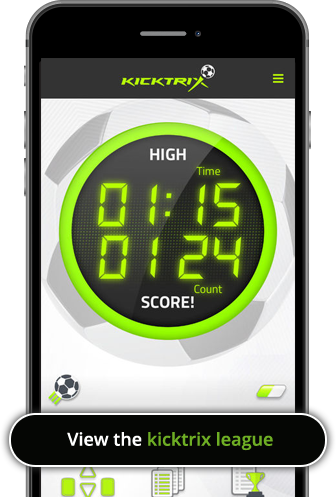 Take stats and scores with you on the KickTrix™ mobile app! Progress from beginner to expert! Download The App on your Android or Apple device and get involved! The Top 10 players will be shown here on the Freestyle League table. Think you’ve got what it takes to become a KickTrix expert?! Not only are we introducing the Freestyle League, we’re giving you another exciting way to show off just how skillful you are. Set up a camera, use your mobile phone or get a friend or family member to record you busting a ‘Round The World’ or ‘Rabona flick’! We want to see everything from ball balancing skills to getting those heels and knees involved! We’ll post our favourite videos right here on the website! Compare & compete with KickTrix scores around the world!